13 November 2014, at 12:00a.m. With group housing systems, stockpeople need to evaluate sows carefully and be prepared to remedy any problems quickly, according to Beth Ferry (Extension Educator in Cassopolis, Michigan) and Ronald O. Bates (State Swine Specialist, Michigan State University) in the latest issue of 'MSU Pork Quarterly'. Pork producers in multiple states, including Michigan have legislative or regulatory mandates to house gestating sows such that they can turn around freely without impediment, lie down, stand up and fully extend their limbs. In addition, many food companies have made statements that would ultimately cause their suppliers to comply with a similar mandate. The implementation of this mandate will cause producers to house sows in groups during gestation. The change from housing sows in stalls to group housing is not just simply changing the penning. There are critical sow care and welfare, productivity and financial considerations to evaluate. Pork producers that make this change must evaluate how their animal management and employee training program will change, what productivity differences may occur and how the initial capital costs as well as any changes in cost of production will ultimately affect their farm business. Companion articles discussing different aspects of group sow housing for gestating sows can be found in previous editions of the Pork Quarterly. This article discusses day-to-day management of sows in groups. Within any type of pork production facility, independent of design, the development of daily routines are key to maintaining proper animal care. The primary daily care needs for sows will be the same, regardless if they are housed in stalls or in pens. However the methods used to provide daily care for group housed sows must be adjusted to provide effective care efficiently. As stockpersons transition from stall to group housing systems, management should provide training to improve the skill and competency of farm staff. Prior to the farm staff entering the barn to start the work day, it is essential that they are prepared. The more time spent in the barns observing the animals, the more stockpersons will be able to better manage sows that may need help when housed in pens. Stockpersons should enter the barn with the needed equipment and supplies to complete routine tasks as they occur. A checklist of responsibilities and needed materials will help stockpersons organize for the day and negate the need to go back and forth from the barn to storage and supply areas. Traditionally, swine farms hire and train stockpersons to become task-oriented people, who focus on completing singular tasks throughout the day and the succession of these singular tasks to complete the work day. When working with sows housed in groups it is important for stockpeople to focus on multiple tasks at one time and be aware of what is happening in the barn as a whole as well as in each pen. Improving observation skills is a challenging task, however, once accomplished will improve the overall efficiencies on the farm. As stockpersons complete their daily routine, they should incorporate their observation skills into every task that takes place on the farm. Group housing systems can increase the possibility of injury or lameness for the sow. Every time stockpeople are around the sows, they should be evaluating them for soundness and health status. This should happen at every interaction with sows, including feeding, heat checking, pressure washing, etc. Also, as stockpersons are walking through the barn from one location to another they should be observing sows in pens as they pass by. It is important that the farm staff be able to identify issues that may arise and take care of those issues, as they complete their duties. For example, in Electronic Sow Feeding (ESF) systems, during the initial training period when the training gates are in use, stockpersons should regularly check to see if sows are moving through the feed station. It is imperative that each female be trained to use the feed station. Therefore as stockpeople are walking through the barns, they need to recognize that sows may need assistance and training to enter into the feed station. Stockpeople need to take the time when they first notice this situation and complete the task so that every sow has an opportunity to consume her feed allotment within a feed cycle. Stockpersons must be able to observe and respond to issues as they arise to make group housing successful. The daily work routine will be different based on the group housing system used. Production staff and farm management should develop a workable outline that highlights the important areas to be evaluated each day. Over time this can be updated and changed to accommodate the particular nuances experienced on the farm. For example, stockpersons working in ESF systems will have to be aware of monitoring the radio frequency identification tags used for sows in operation of the feed station. This will include daily monitoring of feed consumed and re-tagging sows as necessary, as well as managing the feed system and training animals to use the feed system. Other group housing systems will have their unique features that must be evaluated daily. 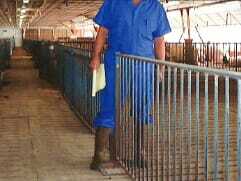 Another example would be sows housed in non-gated feeding stalls, sometimes called short stalls or stanchions. If sows are hesitant to feed when the feed is dropped the sow may be becoming lame, or there may be bullying problems in the pen and management interventions may be needed. In order to provide a complete evaluation of the animals and the facility, it is essential that the farm staff enter the pens to complete their observations. This will allow them to correctly assess the soundness of each animal and examine the area for equipment problems or failures. Pass-through gating (Figure 1) is very convenient for people to move in and out of pens, thus reducing the hesitation of stockpeople to enter pens and evaluate sows. Difficulty in walking and moving around is a common culling reason for sows. These issues are often associated with lameness. This can take the form of short stridedness, inability to put equal weight on all feet or limping, stiffness, etc. These conditions can ultimately lead to a sow’s unwillingness or inability to stand or walk. There are many reasons this will occur and can include injury; poor nutritional status; poor environmental conditions; infectious and noninfectious disease; and poor conformation. Lameness is especially a concern among group housed sows. Research suggests that lameness is consistently associated with an increased risk of removal among group housed sows (Jensen et al., 2010). Farm staff training should include understanding what situations can lead to lameness and to determine what is considered “normal” when animals are standing and moving. In addition staff should be challenged to identify sows that are in the earlystages of changes in stance and movement. For example, sows that may have a wound which could lead to a joint infection should be identified early and treated. Animals that may be just beginning to change the distribution in their weight on their feet (i.e. beginning to carry a foot, limp or “paw” the floor with one foot, etc ) should be identified, examined and treated. In addition sows that may begin to lay away from the group when they had previously been lying with the group may be starting to suffer a health condition that should be examined. The expected outcomes for the daily routine when managing gestating sows is the same regardless of if they are housed individually in stalls or group pens. Sows should be evaluated daily and care and changes in feed allocation should occur as needed. However, the daily routine will change when gestating sows are housed in groups compared to stalls. More attention must be paid to changes in health status that would include lameness, injury, condition and disease status. In addition, sow-to-sow interactions such as bullying and fighting could be more of an issue than in the past. Stockpersons will have to evaluate sows more closely, and be ready to remedy problems that occur either through changes in management or medical treatment. Jensen T.B., M.K. Bonde, A.G. Kongsted, N. Toft and J.T. Sorensen. 2010. The interrelationships between clinical signs and their effect on involuntary culling among pregnant sows in group-housing systems. Animal. 4:1922-1928.